The Stawell Athletic Club has invited ex-Stawell resident turned Race day fashionista Eliza Icke and her husband Brad to judge the 2019 Stawell Gift Fashions on the Field. Stawell locals might remember a young Elizabeth Fraser of the farming family from Callawadda, 20kms north of Stawell. Her parents Scotty and (the late) Cath Fraser were also active members of the community and the Ballroom Dancing scene. It was no surprise that Eliza followed in these footsteps, becoming a ballroom dancer and competing and attending balls throughout Victoria. “I won my first big ballroom dancing title in 1986 as Victorian Belle of the Ball & Overall winner in Geelong at the Annual Star of Stars Ball. She was 17 at the time and the youngest winner to take the title. Sadly Eliza’s mother passed away a year later. Her father, now 93, was on the farm at Callawadda up until 15 years ago and, according to his daughter is still fighting fit, only recently stopping dancing in the last couple of years. However Eliza’s love of ballroom dresses and dressing up stayed with her into her later years when she became involved in Racing fashion. Eliza and her husband have been members of VRC (Victorian Race Club) Flemington & MRC (Melbourne Racing Club) Caulfield for many years. Part owners of race horses meant they attended race days and Eliza started to enjoy the social side of the Fashions on the Field. “I always attended the Stawell Gift with my parents growing up and I enjoyed the atmosphere when thousands of people were brought to Stawell and the District for the Easter weekend Stawell Gift Carnival. It is invaluable for the community, bringing investment to Stawell and surrounds with accommodation, dining outlets and entertainment all benefitting. I really hope it continues for many years as many country areas are suffering. “The Stawell Gift really is a world class event and Central Park is a venue with the most amazing grounds and gardens. “I am absolutely delighted to join Mrs Joan McPherson (family friend of my late mother Cath Fraser) to return to Stawell and be part of the Fashions on the Field event which she has co-ordinated every Easter Saturday for the past 18 years. “It’s a chance for local ladies of all ages to come along, get dressed up and have a wonderful day out. I urge you to support the Stawell Athletics Club, the town and show off your style. You do not need to spend a fortune on an outfit and I encourage all ladies to have a look in your wardrobe and see what you can put together. “I will be looking at Autumn/Winter wear so this is an opportunity to get your beautiful felt/leather hats out, gloves and furs which are a big comeback fashion accessory this season. Weather and fashion appropriate of course. She brings an abundance of experience to Stawell, having competed in fashion shows at events all over Australia. As well as reaching the Top 10 at Flemington, Eliza was recently a finalist at the 2019 Launceston Cup, won at the Canberra Cup in 2018 and a couple of big titles in Qld Sunshine Coast, as well as taking out a plethora of “Lady of the Day”, “Best Millinery” and “Best Couple” accolades at many country race days. Eliza has recently become an ambassador for fashion label Joseph Ribkoff, the Canadian fashion label which is a sponsor of Stawell Gift Fashions on the Field this year. “I am excited to be working with Joseph Ribkoff and promoting and helping out with country race Fashions on the Field events,” said Eliza. 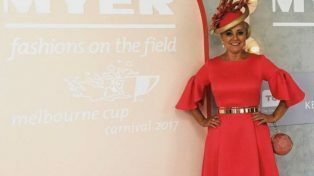 Pic of Eliza in red dress in front of stage at Flemington after the 2017 Fashions on the Field Final.